The Highlands Ranch Cultural Affairs Association (HRCAA) provides a central organization from which educational, artistic, musical, theatrical, and dance events are provided to the more than 90,000 Highlands Ranch residents and those living in the surrounding communities. The Scientific and Cultural Facilities District (SCFD) supports cultural programming in Highlands Ranch through grant funding to the HRCAA. Additional funding comes from community partners, individual donors, and ticket sales. 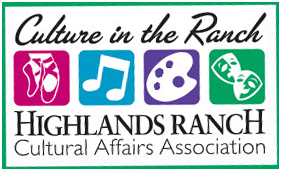 The SCFD supports cultural programming in Highlands Ranch in part through grant funding to the Highlands Ranch Cultural Affairs Association (HRCAA). The SCFD is metro Denver’s unique commitment to its arts, cultural, and scientific organizations. A penny sales tax on every $10 purchase within the seven‐county region supports nearly 300 institutions which provide unique cultural and scientific experiences for millions of people each year. Many of the programs SCFD supports provide free and discounted access to citizens. For more information, visit Scientific & Cultural Facilities District.